Kahama is a large city of approximately 36,000 people in the South East of Lake Victoria diocese that hosts many Lutherans. Due to the distance and the size of the area, there are currently are three parishes, Agape, Sayuni and, Bethania serving the people. 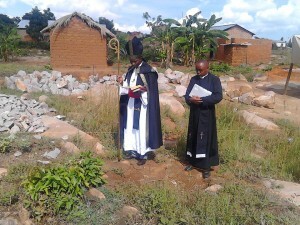 This past Good Friday, Bishop Makala visited Khama, to consecrate the plot where a sub parish will be built. This area is known as Paradiso Shunu. The congregation has a temporary place to worship, but are consecrating a piece of ground where they will build their permanent church. This is known as a sub parish and started at the end of 2014.The congregation is targeting January of 2016 to become a full parish if the building is completed. Often the land is donated, the people clear it, build it with hand tools and the sweat of their brow. They make and cure the bricks. The cost of building supplies for the roof, rafters and floor is very expensive and their economic status makes this a hardship for them. 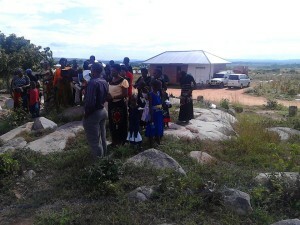 Having a church to worship in is very important to the people and they are very proud of their worship facility. Many congregations in the US and other countries help Lutherans achieve this by helping cover the cost of these supplies for their building. Please remember this congregation in your prayers. Contact Bob Allen, US contact with questions, suggestions or donation opportunities.